Here’s a video of a well trained English springer spaniel demonstrating obedience during a dog shop. You’ll note that the tail is docked, and the ‘stocky’ build is indicative of the show (bench) line of the breed (the field line is less stocky, and in my opinion, more agile). Note the constant use of eye contact to maintain communication. Springer spaniels are sociable, even with other dogs, and quite level-tempered. They are intelligent and eager to please (‘biddable’) so they are easier to train than some other breeds. The Springer was bred originally as a working dog. An outdoors dog has the genes for running, swimming, and staying active. So, they need exercise, but this makes training them a lot of fun – they keep the owners active too! They want to get it right although they can be stubborn if trained the wrong way. If you take on a springer spaniel rescue dog, then bear in mind that some re-training may be necessary. If you have a puppy, though, then it is much easier. Kennel Clubs usually run puppy training classes, and after the basic training – ‘boot camp’ – there are various levels, typically bronze, silver and gold. You and your springer must pass a test so that you can start training at the next level up. The course is straightforward though; different springers have different difficulties with exercises, but the trainers will help you and you dog surmount these hurdles (often literally). And so you and your springer progress from level to level. Training field dogs is a completely different process – they need to get used to the sound of guns and learn to work in a team with another dog. They are also at a much greater distance fromt their owners, on average, and signalling techniques differ – they may be out of sight in undergrowth, or swimming to retrieve. Here’s more on field training and exercises. 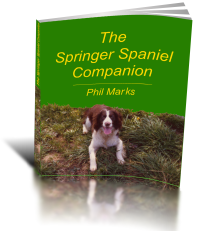 What are Springer Spaniels Rescue Dogs?